We are asking the President and Congress to label our beef. We know where our fruit, vegetables, fish, chicken, lamb, and nuts come from but not our beef. Help protect our food and agriculture, help label our beef! If COOL for beef is to be restored, then you must do it! We need Congress to restore COOL for beef and this will only happen if your Senators and Representatives commit to introducing legislation to do so. Contact information for every Senator and Representative seeking 2018 re-election is listed at www.labelourbeef.com. Call and e-mail each of your Senators and Representatives and get them to commit to introducing COOL legislation right now if they want you to vote for them again, and hold them to it (meaning you will want to call each of them on a regular basis until COOL is restored), as they are being constantly pressured by the opposition. 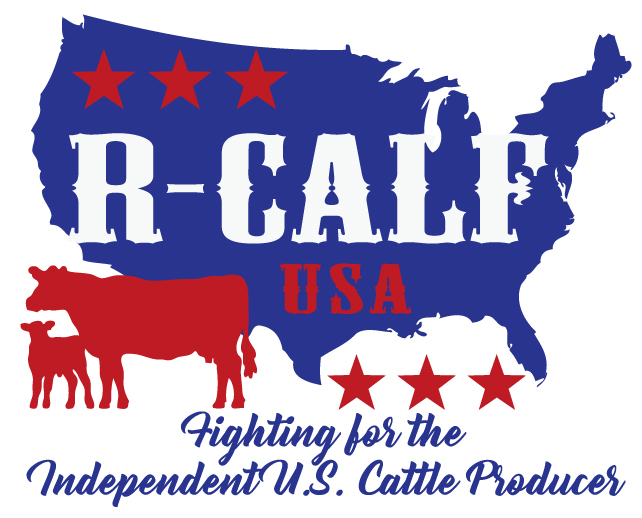 We at R-CALF USA are a group of independent, American ranchers who take pride in the beef we raise for you and your family, and we believe everyone has a right to know where their beef comes from, and how it was raised. If you go to the supermarket and buy beef or pork products plastered with the words "PRODUCT OF U.S.A.," you might assume that the meat actually came from domestic livestock. But you’d probably be wrong. The USDA doesn't require beef and pork to be labeled with its country of origin, meaning multinational corporations can (and do) pass off their imported products as U.S. goods. If this seems wrong to you, you're not alone — in recent polling, at least 90 percent of consumers say they want to know where their meat comes from. R-CALF USA has taken the USDA to court. The court agreed with us that independent beef producers are harmed by lack of COOL however, the court said it couldn't do anything to aid ranchers; that it requires executive or legislative action. That is why R-CALF USA is building this campaign to raise awareness for executive and legislative action. Immediately after Donald Trump was elected president, he stated he would stand up for American farmers and ranchers by reinstating COOL. But within days, the Trump administration succumbed to pressure from multinational corporations and reneged on his pledge. We are demanding Trump follow through and ensure that COOL is part of his administration’s agenda. This administration’s trade policies must protect American producers and consumers, not just corporations, by bringing back COOL. Please help show the new administration that the public remembers the president's commitments and we demand a government for the people and not just for multinational agribusinesses. Your donation will fund R-CALF USA’s nationwide campaign to raise public and voter awareness for COOL via direct mail, radio ads and internet ads to bring back COOL. R-CALF USA (Ranchers-Cattlemen Action Legal Fund, United Stockgrowers of America) is the largest producer-only cattle trade association in the United States. We are a nonprofit, nonpartisan, member-driven organization. Prefer to donate by mail? Make checks payable to R-CALF USA/COOL and mail to: PO Box 30715 Billings, MT 59107 and your donation will get added here. To learn more visit www.r-calfusa.com. Help R-CALF raise $75,000 by making a donation. $50 donors get a one (1) year membership. $100 donors get a one (1) year membership renewal. $250 donors get a one (3) year membership. $275 donors get a one (3) year membership. $500 donors get a one (1) year membership and (1) convention ticket to R-CALF USA's Annual Convention and Trade Show. $1,000 donors get a one (1) year membership and (2) tickets to R-CALF USA's Annual Convention and Trade Show. (Optional:) Your ranch logos/brands, ranch life/family photos will be featured in newsletter, on our website, and at convention. $5,000 donors get a one (1) year membership and (4) tickets to R-CALF USA's Annual Convention and Trade Show. (Optional:) Your ranch logos/brands, ranch life and/or family photos will be featured in newsletter, on our website, and at convention. Our campaign is off the ground and this advertisement will be seen in sale barns across the country! This month, R-CALF USA members and COOL supporters will receive their own bring back COOL message to personalize and send to President Trump! Thank you so much for your support! This campaign is made possible because of you! Visit our official campaign page at www.LabelOurBeef.com. We've raised over $10,000 to bring back COOL and this campaign is still in its pre-launch phase! A majority of ranchers are not yet online and our campaign hasn't reached their mailboxes yet. Our campaign will also will be seen in sale barns across the country! Donations may be sent to our national office at R-CALF USA/COOL, PO Box 30715 Billings, MT 59107. Be sure to write COOL with your payment and your name and contribution will be added here. Thank you so much for your support! Many thanks to our generous donors who have helped get our COOL Campaign off the ground! Thanks to your support R-CALF Members and Bring Back COOL Campaign Supporters will soon be flooding the White House with thousands of Messages to President Trump: Bring Back COOL for beef! Please continue to donate/share this campaign. We will keep you updated! In 2015 Congress repealed the COOL law on beef and pork and its up to us to bring it back! Support this campaign and help U.S. farmers and ranchers show Congress and the new Administration that hardworking Americans deserve to know where their beef is from and we are going to do whatever it takes to bring COOL back! We intend to fill social media, the internet and Washington, D.C. with our message to President Trump and Congress: Bring Back COOL! Thank you for joining the fight! We will keep you posted more to come! R-CALF USA (Ranchers-Cattlemen Action Legal Fund, United Stockgrowers of America) is the largest producer-only cattle trade association in the United States. We are a nonprofit organization, all donations further our work to bring back COOL. Prefer to donate by mail? Make checks payable to R-CALF USA/COOL and mail to: PO Box 30715 Billings, MT 59107 and your donation will get added to this campaign. We’d like to thank Fox News Commentator Tomi Lahren for using her platform to help save American ranchers and farmers. Tomi Lahren says Trump must act to help American cattle ranchers. The U.S. economy has lost 13.6 BILLION since the COOL (country of origin labeling) law was repealed in 2015. Foreign governments and the big meat packers lobbied hard for the repeal, and our legislators folded. Where's the beef...from? In 2015 Congress repealed the COOL (Country-of-Origin Labeling) law on beef and pork and we intend to bring it back! Do you want to know where your beef is from? If yes, click below to support the campaign to bring COOL back before its too late! We will keep you updated on our progress! Thank you so much! The Bring Back Country of Origin Labeling Campaign has raised over $5,500! Hardworking Americans want to know where their beef comes from and R-CALF USA wants to get COOL back for them. Join thousands of ranchers join the campaign to bring back COOL. Click Below. Today R-CALF USA CEO Bill Bullard met with Trump's White House Advisors in Washington, D.C. to discuss bringing back the COOL (Country-of-Origin Labeling) law. In nearly 4 days our campaign has raised nearly $4,000 to bring back COOL - this is a great start! We've all seen the lengths which Meatpackers will go to obstruct COOL which is why its important we reach our goal to bring back COOL. Help show Washington, D.C. U.S. ranchers and consumers want COOL!